Soft, alluvial soil in this primeval-feeling arroyo was subject to flooding by winter run-off from hillsides above. In 1983, citing new, unpublished requirements, City engineers stamped proposals for a 2800 s.f. house “UNBUILDABLE”. 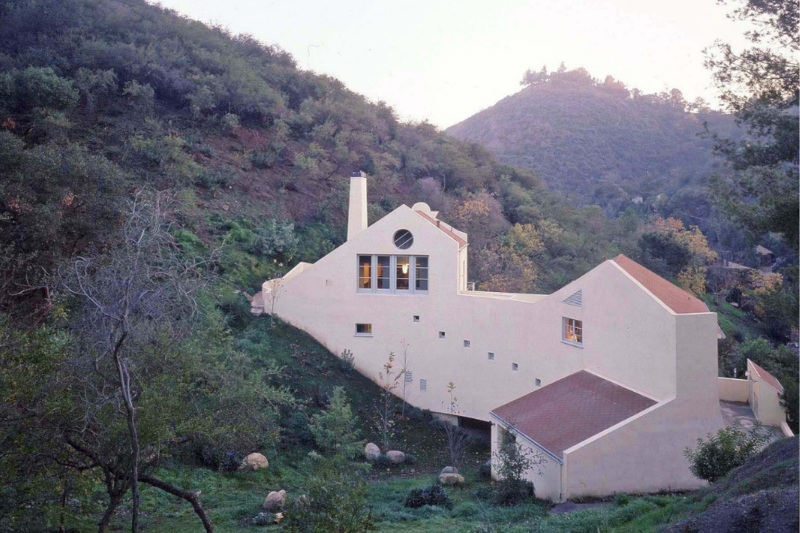 Owners, UCLA architecture professor, Barton Phelps and attorney Karen Simonson, drawn to L.A.’s mountainous urban fringe, persisted, demonstrating how an imaginative design could safely bridge a walled channel and still merge with nature. Two years later they moved in. Called “Arroyo House”, it met with immediate acclaim. Cited for innovative resolution, sculptural strength, and masterful lighting and coloration, it received Honor awards from AIA/LA and AIA/California Council juries and was published in American journals from Progressive Architecture to Architectural Digest and others world-wide. Spun from a traveler’s dream of two pavilions split by a brook (see Vignola’s 16th C. Villa Lante in Bagnia), functional/topographic facts linked these two casini, raising one above the other.Entry is from a “drive-in foyer”, where broad timber steps begin the bridge. Inside, a tall gallery / stairwell links very different volumes: dining room, patio, bedroom, and library and backs into a curving wall that welcomes the phenominal downward sweep of the arroyo. Conceived wryly as a transformational sequence for shedding city temperament, the stair climbs to an intimate fireplace court opening onto a hillside pathway bowered by native oaks. Thick walls, indoor / outdoor ambiguity, and natural cooling are abstracted from climatically appropriate pre-airconditioning techniques of the 1920’s – already green by present standards. Property expansion to 1.5 acres points toward an Edenic ideal not at first envisioned. Once an end-of-the-lane destination, Arroyo House has become a portal to garden spaces, seasonal look-outs and a treehouse. Upper and lower paths follow the remodeled streambed through a redwood grove to reveal a walled parterre and vineyard terraces built using drystacked revetments of recycled concrete. The occasional winter waterfall is slowed by a cistern and culverts splash onto the rocky streambed. Three giardini segretti step upward, framing views across the arroyo, the house made distant by the redwoods. Beyond tended landscape, trails wind over terrain never cleared except by wildfire. Barton Phelps is principal of Barton Phelps & Associates, Architects and Planners in Los Angeles. His works range from redesigning UCLA’s landmark Royce Hall or crafting new industrial facilities for the Los Angeles Department of Water and Power to the recently completed Milligan Arts Center at Thacher School in the mountains above Ojai, and River House, a rural retreat on a thousand-acres in the Missouri Ozarks. A native New Yorker, he holds a B.A. with Honors in Art from Williams College and an M.Arch. from the Yale School of Architecture where he was teaching assistant to architectural historian, Prof. Vincent Scully. He taught at Rice University for two years and then, for two decades, was a member of the faculty at the UCLA Graduate School of Architecture and Urban Planning. His independent research on collective landscapes has received fellowships from the AIA Foundation, National Endowment for the Arts and Graham Foundation for Advanced Studies in the Fine Arts. For his contribution to design advancement, he was elected a Fellow of the American Institute of Architects in 1993. As national Chair of the AIA Committee on Design, his 1996 symposium series, Changing American Landscapes: the View from the River surveyed altering effects of 20th Century use on built landscapes of the Mississippi River valley.He is a Life Member of the Society of Architectural Historians. Formerly architectural advisor to the U.S. State Department, faculty member Mayors’ Institute on City Design, Design Excellence reviewer, U. S. General Services Administration, and juror for national AIA Honor Awards in Architecture, he currently serves on the Mayor’s Design Advisory Panel, City of Los Angeles and Design Review Committee, U.C. Santa Barbara.